Lake Fork is located about 80 miles east of Dallas Texas. conducting The Bass Clinic on Lake Fork since 1990. Info about Lake Fork, the premier trophy bass lake of Texas. A list of Roy Greer's accomplishments and contributions. A convenient form to request more information. Bass fishing and crappie fishing pricing for instructional fishing and private lake trips. 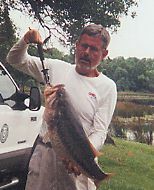 Info on fishing with Roy on a 15 acre private lake, adjacent Lake Fork. Links to some interesting sites. Lake Fork Texas is the premier trophy bass lake in the state. Throughout the 90's Lake Fork has produced an unchallenged numbers of 13+ pound bass, leaving no doubt that Lake Fork is still the #1 trophy bass lake in the state of Texas. Prior to impoundment, the ponds that would eventually be inundated were stocked with Florida strain largemouth bass up to 8.5 pounds. The fish grew in these ponds until the ponds were inundated and became part of Fork. The Lake achieved national recognition in 1986 when a 17 pound 10 ounce bass was boated. In the following five years, more 13+ pound bass were caught out of Fork than any other lake in the southeast U.S. bringing national and world recognition to the lake. This project is located on Lake Fork Creek, a major tributary of the Sabine River, about 5 miles west of Quitman, Texas. The reservoir, owned an operated by the Sabine River Authority , inundates land in Wood, Rains, and Hopkins Counties. Preliminary engineering studies for the Lake Fork Reservoir Project were initiated in November, 1972. Construction work on the project began in the fall of 1975. Final closure of the dam was made in February, 1980, and conservation pool level was reached in December, 1985. A total of 41,100 acres of land were acquired for the project. The Reservoir has an estimated surface area of 27,690 acres at conservation pool elevation 403.0 feet above mean m.s.l. (mean sea level) and extends up Lake Fork Creek about 15 miles. The earthen dam consists of a rolled-earth fill about 12,410 feet long with a crown width of 20 feet at elevation 419.5 m.s.l. The upstream slope of the embankment is protected from erosion by two feet of soil-cement. The overall length of the service spillway structure is 250 feet. The flow of water over the concrete ogee wier is controlled by five 20 by 40 foot tainter gates. Also contained in the spillway structure are two 5 by 8 foot low-flow outlets and three metered water release pipes. The design discharge of the spillway is 81,900 cubic feet per second. FISHING LICENSE: License sales by phone are available by calling (1-800-895-4248) 24-hrs./day, with approved VISA or MasterCard. Licenses can be purchased by phone for immediate use without waiting to receive an actual paper license by mail ( not valid for deer or turkey hunting due to tag requirements). You can also purchase your licenses from most Lake Fork merchants. PRIVATE LAKE FISHING: No Texas or non-resident fishing license required on private waters.